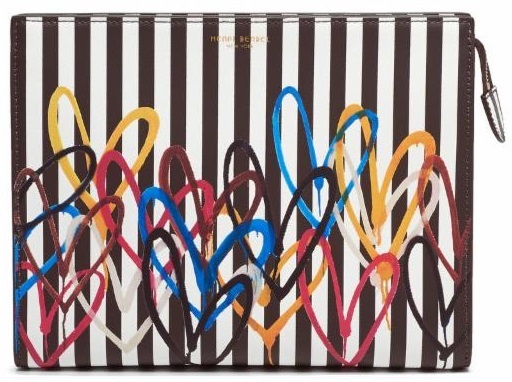 Henri Bendel is teaming up with legendary Love Wall artist, James Goldcrown to bring an interpretation of his signature Bleeding Hearts mural to the brand's signature brown and white striped accessories in an exclusive capsule collection. A stylish combination of street art and fashion, this limited edition collection is inspired by messages of love and togetherness. 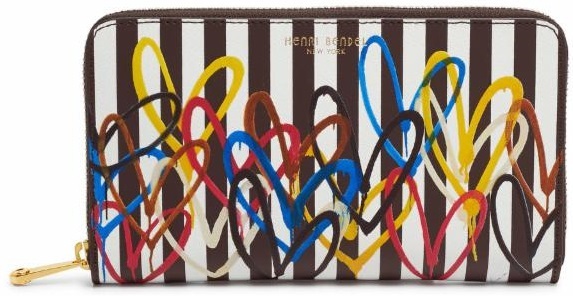 Available at all 29 Henri Bendel stores nationwide and www.henribendel.com, the James Goldcrown for Henri Bendel collection will include three styles of leather accessories including a Love Stripe Cosmetic Clutch ($128), Love Stripe Zip Continental Wallet ($198) and Love Stripe Smartphone Crossbody ($118). "I am honored to work with Henri Bendel on a capsule collection this spring," said artist James Goldcrown. "I look forward to seeing my artwork come to life on the brand's signature brown and white stripes." A portion of proceeds from the collection will benefit Kind Campaign -an internationally recognized nonprofit organization that brings awareness and healing to the negative and lasting effects of girl-against-girl bullying through their global movement, documentary film, in-school assemblies and educational curriculum. "We are thrilled to be in collaboration with James Goldcrown and Henri Bendel on this unique collection which promotes love, kindness and unity. More than ever before, we recognize the ability fashion has to be a powerful vehicle to spread positivity and we thank the artist and the retailer for being a part of that movement. A portion of each sale will go back to Kind Campaign's Free To Be Kind Initiative, which provides free assemblies and curriculum to thousands of schools and communities across the world." -Lauren Paul and Molly Thompson, Co-Founders Kind Campaign. To celebrate the brand's annual Bendel Bash, from June 3-10, shoppers will be able to get a free limited edition Love Stripe Canvas Tote and Love Stripe Water Bottle with a purchase.